Pizza ovens are a wonderful addition to any alfresco kitchen. With a gas-fired pizza oven, you can be catering for a horde in just 15 minutes flat. With pizzas only taking several minutes to cook, many of our clients use their pizza oven more often than their BBQ! Wood fired pizza ovens are a stunning feature in your outdoor area. Once alight it gives the ambiance of a traditional wood fired pizza’s and a great talking piece. Before choosing a pizza oven, there are important points to consider. Be sure to check out our FAQs at the bottom of this page. Outdoor Alfresco Kitchen’s Range of gas fired and woodfired pizza ovens caters for all requirements. 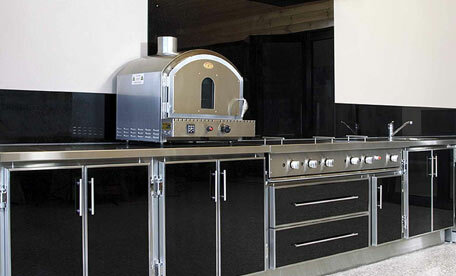 We have small to extra large pizza ovens, indoor use approved to outdoor use only and pre-built units to DIY units. Outdoor Alfresco Kitchens can install, flue and build bases for your new pizza oven. As a manufacturer we have many options and styles to choose from. This Indoor/ enclosed area approved (WA ONLY) Gas fired pizza oven is the perfect addition to your new alfresco area. 3. Suitable for installation in outdoor or enclosed areas when installed with appropriate ventilation in Western Australia Only. can construct it for you on-site. pizza oven flue is made from Stainless Steel and can be used outdoors. charge for locations that have stairs or are hard to access.